Are you looking to give your living room a relaxing ambience and warmth? Investing in a high-quality electric fireplace heater will bring along the additional comfort, reliability, and conveniences that most standard fireplace heaters lack. 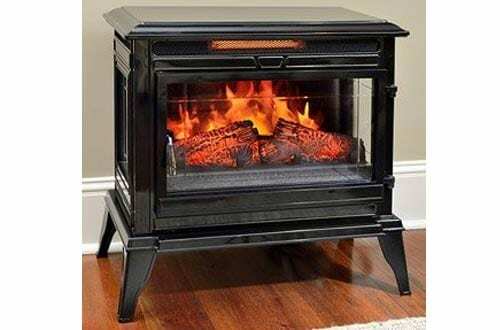 With the electric fireplace heaters, you don’t have to worry about charcoal or firewood. 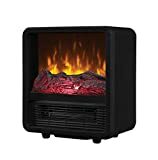 Electric fireplace heaters are great, but unfortunately, the market is crowded with hundreds of model and brands making the selection of the best one a challenge. 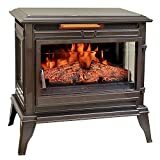 You don’t want to buy an electric fireplace heater that will hike your energy bills. 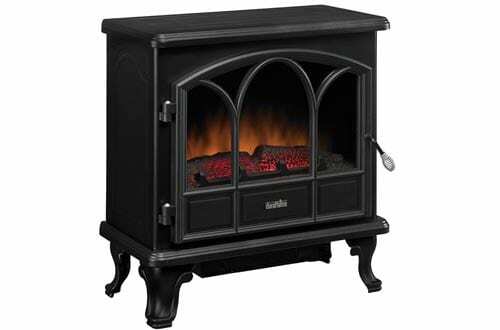 Some of the best models in the market are energy efficient, well-priced and have great designs. On top of that, they are well-built and offer consumers value for their money. 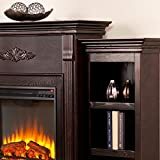 This article is aimed at helping you make a wise choice by narrowing down on the best electric fireplace heaters in the market currently. If you want the very best, then choose from the list below. 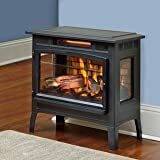 The Duraflame is a great electric fireplace heater to start our list with durable metal construction, side viewing windows and an operable door for use easy. The heater uses the infrared heat to help maintain natural humidity in the house resulting in a comfortable heat that doesn’t completely dry the house of all the moisture. It stays cool to touch and safe around kids and pets. 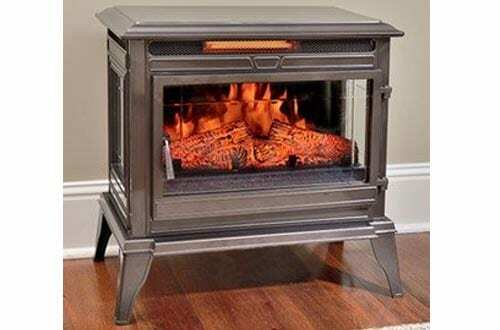 The DFS Heater provides up to 4,600 BTU heats that are enough to warm up to 400 square feet of your house. The heat supply is enough to keep most of the house warm and ambient during the chilly nights. 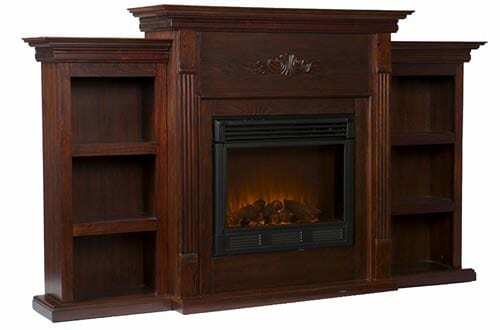 The design of the heater is great with a charming picture window that has a detailed arched frame. The realistic flame effect with glowing log and ember can be operated with or without heat providing users with gentle rolling heat year long. It has overheat protection allowing to shut off when it overheats. 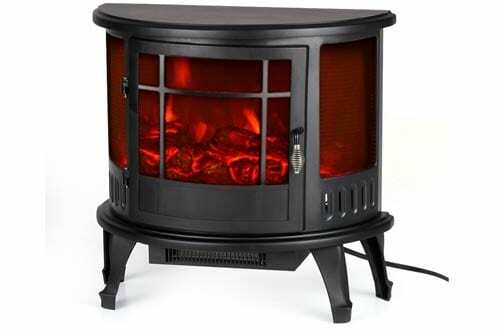 The Comfort Smart Jackson heater is a portable option for those who love something light and easy to move around. Fireplace stove plugs into a standard 120V outlet making it ideal for most of your sockets at home. It comes with a multi-function remote control that allows you to operate most functions from your place of comfort. It uses the Infrared heat warming a great area of up to 1000 square feet. This one has a 4,600 BTU heater that provides a supplemental heating zone of up to 400 square feet warming most of your house. 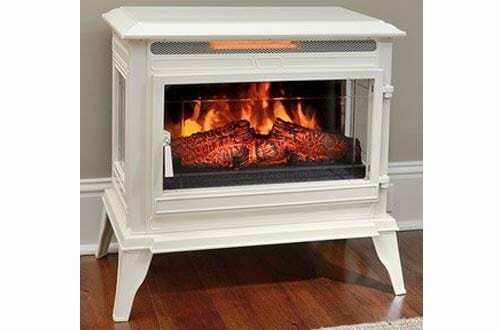 It is a sturdy metal construction heater with an upgraded door handle. The flame is realistic with a glowing log and ember that can operate with or without the heat. 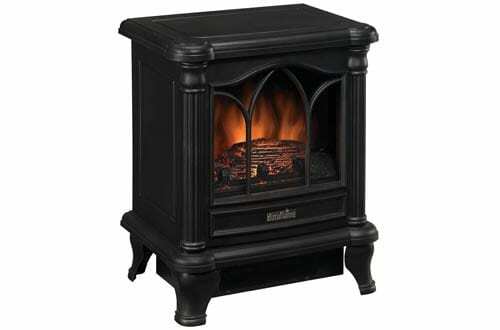 It is a safe option around pets and kids providing you with gentle heat year long. There is an overheat protection that will shut the heater when it overheats. With 4, 600 BTU heaters, the Twin Star is a great electric fireplace heater providing enough supplemental heat for up to 400 square feet. It is a great choice that is nicely designed and with a realistic flame of the log and ember. The log and ember don’t need the heat to look real. Users can easily adjust the heat settings from low to high heat depending on the current condition of the house. It is thermally protected shutting itself when overheating. It is a great choice for homes with kids and pets. 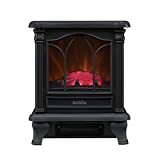 The Homgeek is a stunning classical design heater with a real fire and mesh around it. It is an appealing heater to have in your home adding to your home décor. The design of the heater is compact making it great for indoors and around the corners. It is free standing with a vintage design that looks stunning in your living room. It is pretty easy to use and works efficiently ensuring safety. 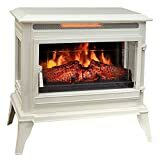 If you’re looking for style in a fireplace heater, the Jackson Cream is a great pick with an elegant style and cream finish to make any home stunning. It is compact and portable ideal for homes with minimal space. Users can easily operate it using a remote. It warms a large area up to 100 sq ft. This is a perfect heater that heats using infrared that maintains the humidity in the air. Homes get to experience a most comfortable heat without the air completely dry. 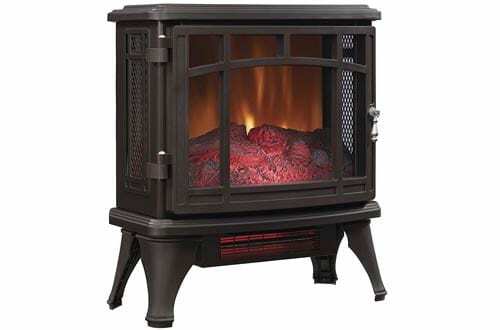 The 5, 200 BTU heater provides enough supplemental zone heating to cover 100 square feet. 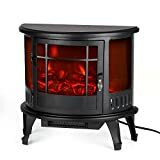 It is a sturdy metal construction heater that has been fashioned with an arched door and a realistic flame effect of a glowing log and ember. A heater is a safe option for kids and pets all year long. The Jackson Black is a portable heater that plugs into a standard 120V socket making it easy to fit all sockets in your home. It is quite light and easy to move around. The compact design ensures it fits into all corners with ease. Most of the functions on the heater can easily be remotely operated. 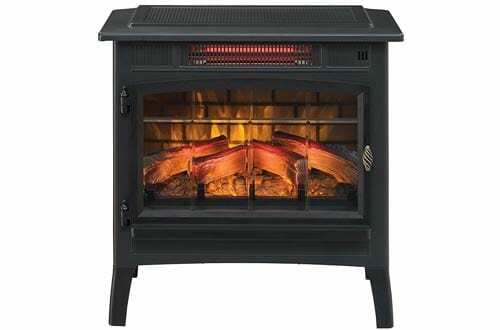 Warms up to 1000 Sq.ft and has a digital thermostat for regulating heat. 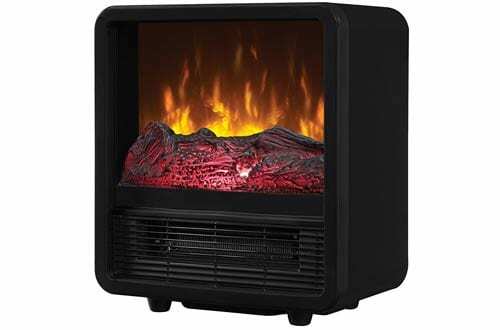 The Tennysone is one of the best fireplace heaters that adjust the thermostat using a remote control. It comes with advanced remote features that allow you to set the log, the time and the flames separately. The flames are real and burn well with the embers leaving dynamic embers effects that pulsate from dimmer to brighter. The top is wide and does not get hot making to accommodate a flat TV safely. Temperature ratings can be varied from 62-82 with a 4-degree interval. This is a safe option with a self-regulating timer that turns off when the temperature is too hot.